On Saturday, May 23, join Deadspin in Chicago for the 3rd-annual Deadspin Midwest Pants Party. It's good to get out of the house a couple times a year; make this one of those times. 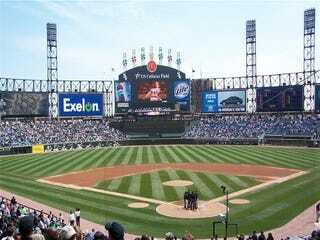 The Deadspin Midwest Pants Party will again take place at US Cellular Field, ostensibly for the purposes of watching baseball. However, this year's opponent is the Pittsburgh Pirates. Maybe we'll get to see Rinku and Dinesh pitch; they can't be much worse than John van Benschoten. Tickets are $72.50 and include an all-you-can-eat buffet and perhaps more importantly, all the beer, wine, and soda you can cram down your gullet from 4:30 PM until a half hour into the game. After they drag us kicking and screaming away from the beer, we will move into the outfield seats for the remainder of the game. For those truly seasoned boozehounds out there, we will probably gather at a nearby bar TBD before the gates open for some pre-pre-gaming. Last year's chosen pregame bar was closed due to a gas leak. These things happen on the South Side. Tickets can be purchased by following the PayPal link below. Friends, relatives, spouses, and significant others are welcome. Questions can be directed to me at pete@deadspin.com. Hope to see you there.